Arboviruses (arthropod borne viruses) have been all over the news lately. You’ve heard of the West Nile virus outbreak this year, a mosquito-borne disease that causes fever, headaches, body aches and potentially serious illnesses such as West Nile encephalitis and West Nile meningitis. To date, CDC reports 1,118 cases of West Nile in 42 states, including 41 deaths. Given that this is the most cases detected through the first three weeks of August since the disease was first detected in 1999, 2012 is well on its way to being the largest West Nile outbreak in the United States. There is also concern about Eastern equine encephalitis, commonly known as EEE, another mosquito borne virus that can cause severe illness in humans. That pesky mosquito bite is now something to be more concerned about. 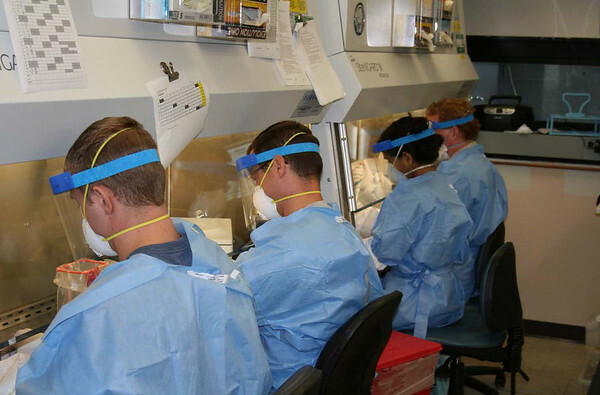 The mosquitoes have kept the Massachusetts Bureau of Laboratory Sciences working hard as their state has been hit especially hard this summer. EEE has been in Massachusetts since 1938 and the Massachusetts Bureau of Laboratory Sciences has been conducting surveillance since the 1950s. Dr. Sandy Smole, the Director of the Division of Molecular Diagnostics and Virology says this year has been unprecedented in the amount of testing the public health laboratory is performing. They have detected arboviruses 3-4 weeks earlier than usual and have more positives than in years past. Experts think this unprecedented year may be due to the mild winter with no hard freezes to kill off the mosquito populations. 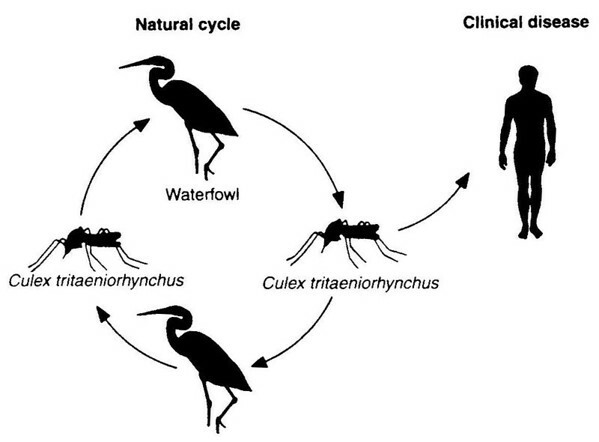 The natural cycle of West Nile virus and EEE is between birds and mosquitoes (see graphic) – birds are the reservoir host and are bitten by mosquitoes that pass it on to other birds that are bitten by other mosquitoes that then pass it on to other birds and so forth. Some of those mosquitoes also bite humans. In years like this one where there are more mosquitoes than usual, there is a greater likelihood that those mosquitoes that do bite humans will also be carrying one of these arboviruses. In Massachusetts, the lab typically detects EEE in mosquitoes that bite birds before they detect it in species that also bite humans. Due to the higher number of mosquitoes, this year it has often been the reverse. So what exactly does the laboratory do? Today they work with nine mosquito control projects around the state to monitor arboviral activity in mosquito populations. Mosquitoes are collected over a 24 hour period at different locations around the state primarily using CO2 baited traps with a CO2 canister or dry ice. Surveillance is primarily interested in monitoring the species of mosquitoes that bite humans, so the trapped mosquitoes are sorted by species and sent to the public health laboratory for testing. Back at the laboratory, Dr. Smole and her team pool mosquitoes into sets ranging from 10-50 mosquitoes. Mosquito pools are then homogenized, centrifuged, extracted and then screened by PCR for EEE and West Nile virus. Positive pools are reported back to the mosquito control projects through a web-based database, wherein recommendations can be made to local boards of health about curtailing evening activities or aerial spraying. Avoid being outside during dusk and dawn when mosquito activity is at its peak. Wear repellent! Use an insect repellent that contains DEET, oil of lemon eucalyptus, picaridin or IR 3535. Cover yourself! Wear long pants and long sleeved shirts to avoid bites. Remove any standing water where mosquitoes like to breed—buckets, flower pots, swimming pool covers, bird baths, etc. For more prevention tips, visit CDC’s West Nile Fact Sheet. For more information on Massachusetts’ Arboviral Surveillance program, click here.